I am reminded of a the film where The Beatles all arrive home, enter separate front doors, and end up in the same combined house behind. 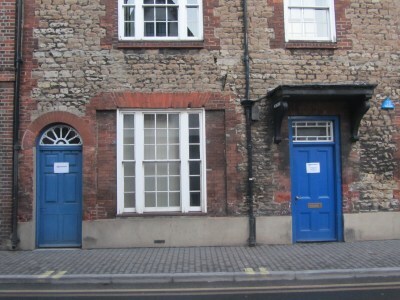 At Abingdon Surgery on Stert Street, both these doors have an arrow pointing further up the street. 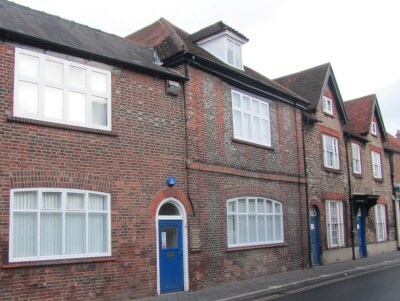 The entrance to the surgery is now where Thomas & Co used to be – before they moved to Lombard Street. 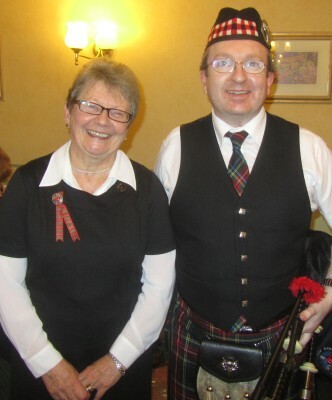 25th January – Burns night – second national day of Scotland – and ex-pat Scots have been reciting poems by Rabbie Burns, eating haggis with neeps, and playing the bagpipes in a number of locations in Abingdon. Isabel organises one such event every year at Millstream Court in Abingdon. 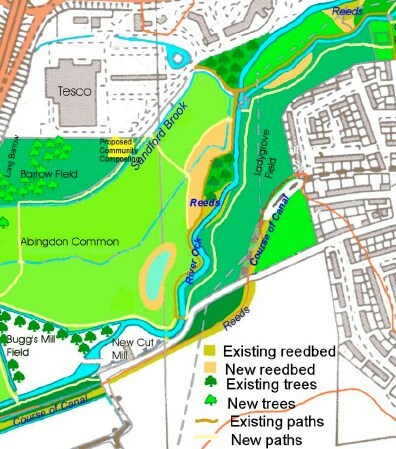 Back in 2002 a group called SAFAG (South Abingdon Floodplain Action Group) put together a detailed plan for developing the meadows along the River Ock near Tesco into a nature reserve. They had just campaigned to stop a hotel and some industrial units being built on the flood plain near Tesco. A nature reserve would stop further building on the flood plain. For anybody interested, you can still read about that the Ock Meadows Nature Reserve project on the Safag web site. 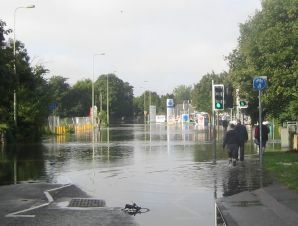 A bad flood did hit Abingdon in July 2007. This view is from the Drayton Road bridge looking south with the Hartwells garage on the right. There is now a new group, the Ock Valley Flood Group, who are actively taking meaures to alleviate flooding. They have a forum at Preston Rd Community Centre on the evening of Friday 18th Feb at 7pm. 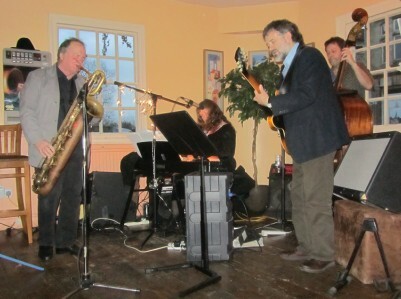 George Haslam and friends were playing at the Broad Face pub – where there is jazz every Sunday afternoon. George will be conducting his Big Band, Swingtime, on Feb 19th to raise money for the Abingdon Arts Festival. The Choose Abingdon community shop will become the Arts Festival gallery and information centre up to and during the festival which starts on 17th March. 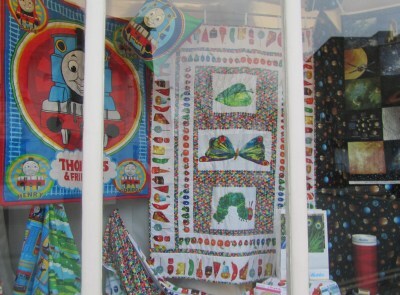 but I see it has also made an appearance at Masons with some other materials for children’s quilt covers and curtains. 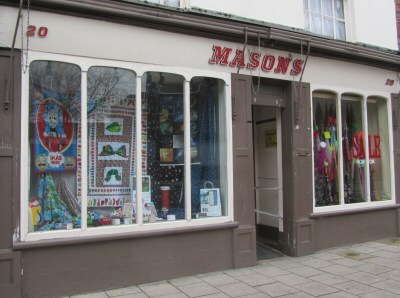 Masons is unique to Abingdon. They have 3 shops supplying Abingdon and the surrounding areas with material for sewing, knitting, needlecraft as well as craft material for jewellery making, card making and scrap booking. There is also a seamstress to fix zips, and you can buy a kilt pin there if you need one for Burns Night.